People don’t pay for algorithms. They pay for solutions. credit: Schur, M. (Writer, Director). (2017). Michael’s Gambit [Season 1, Episode 13]. In M. Schur (Executive producer), The Good Place. Universal City, CA: NBC. credit: http://futurama.wikia.com/wiki/File:Fry_Sleeping.png Schur, M. (Writer, Director). (2017). Michael’s Gambit [Season 1, Episode 13]. In M. Schur (Executive producer), The Good Place. Universal City, CA: NBC. Predicting a value? Suggesting an action? Recommending something? Can we find the data elsewhere? View Data Science + Magic = Profit on Notist. You can’t throw a rock without running into a talk about the basics of data science and best practices for data hygiene. What’s next? Shipping a data science-powered feature takes more than data collection, experimentation, and analysis - it takes magic. 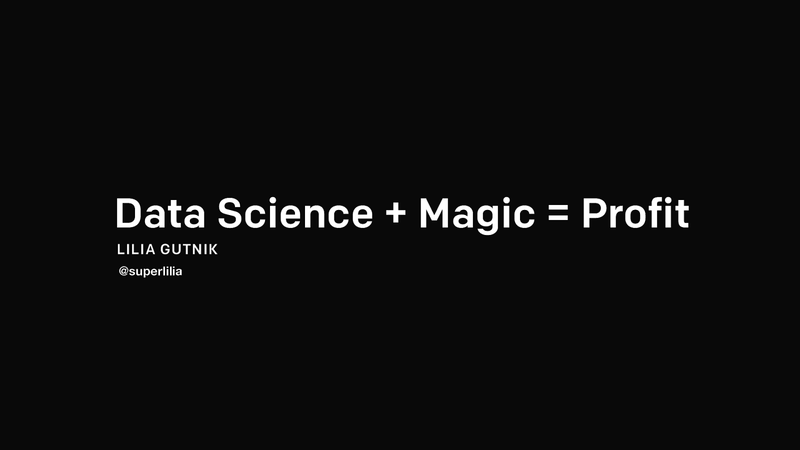 This talk will teach the magic based on the many ~mistakes~ learning opportunities that my team has experienced so that any team will feel inspired to build a customer-facing data science-based feature. What are potential features your team could build that use data science and deliver value to our customers? What does it take to productionalize a data science model? How do you go on call for a data science-based feature that is (by nature) different for every customer? What are the design considerations for a feature that has unpredictable (non-deterministic) behavior? How do you develop a feature that relies on math you (probably) do not completely understand? Lilia puts presentations on for free. You can too. Now #devopsdays is starting to cost me money. Just bought “Interviewing Users “thanks to @superlilia DevOps Days talk. Our environments are a product and our customers are Dev/QA/OPS (to name a few) We should treat it as such. @superlilia gave a great talk at @devopsdaysChi. Wonderful speaker presence and completely engaging. Fun fact: she’s a huge Keanu Reeves fan.